The Salimetrics Transferrin (Blood Contamination) Kit is a competitive immunoassay designed and validated for the quantitative measurement of blood contamination of saliva samples. It is intended for use as an analytical tool to screen saliva samples that should be excluded due to blood component leakage into the oral mucosa, which may interfere with assays for other salivary analytes. It is not intended for diagnostic use. Under most circumstance, blood contamination in saliva is a non-concern, but if research participants are at high risk for oral injury or poor oral health, monitoring transferrin in saliva is a necessity. The quantitative measurement of analytes in saliva is invalid if the physiochemical and physical barrier between blood circulation and the oral mucosa is compromised such that there is a “leakage” of blood or plasma into saliva. This is especially true when levels of the analyte of interest in blood are substantially higher than levels observed in saliva (i.e., ng/mL in serum vs. pg/mL in saliva). Screening samples and excluding those contaminated by blood may be critical if valid conclusions are to be drawn from salivary data. 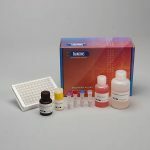 The Salimetrics Blood Contamination Enzyme Immunoassay Kit is a competitive immunoassay specifically designed and validated for the quantitative measurement of the presence of blood in saliva samples. It is not intended for diagnostic use. It is intended only for research use in humans and some animals as an analytical tool to screen saliva samples that should be excluded from assays for other salivary analytes because of blood component leakage into the oral mucosa. Salimetrics has not validated this kit for serum or plasma samples. The quantitative measurement of analytes in saliva is invalid if the physiochemical and physical barrier between the general circulation and the oral mucosa is compromised such that there is a “leakage” of blood or plasma into saliva. This is especially true when levels of the analyte of interest in blood are substantially higher than levels observed in saliva (i.e., ng/mL in serum vs. pg/mL in saliva). Screening samples and excluding those contaminated by blood may be critical if valid conclusions are to be drawn from salivary data. A computerized literature search revealed that, with few exceptions, investigators working with salivary measurements rarely screen samples for this problem. This suggests that most researchers may be unaware that this phenomenon might be affecting their salivary data. Studies that report screening samples typically use a dipstick method designed for use with urine specimens. However, saliva contains peroxidases, which cause the same color change on the dipstick as does hemoglobin, leading to false positive results. Therefore, the dipstick method is not an accurate measurement of blood contamination in saliva. To solve this problem, Salimetrics designed a simple, efficient, and inexpensive immunoassay for researchers to use as an analytical tool to screen samples for blood presence in saliva. Each 96-well plate screens 80 samples with only 1 hour of total incubation time and uses only 20 µL of sample per test. We expect that the routine application of this screening tool will significantly improve the quality of the information learned in future studies. The Salimetrics Salivary Blood Contamination Enzyme Immunoassay quantitatively measures transferrin, a large protein (mol wt of 76,000) present in abundance in blood that is normally present in only trace amounts in saliva. 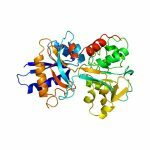 Higher levels of transferrin measured in saliva by this assay indicate the presence of blood contamination and serve as a warning to investigators that samples should be excluded from subsequent quantitative assays for salivary analytes and statistical analyses. As a general guideline, saliva samples with transferrin values 0.5 mg/dL or higher should be candidates for exclusion when assaying salivary samples for testosterone. Values greater than 1 mg/dL should be considered as candidates for exclusion in other salivary assays. The criterion score adopted will vary depending on the analyte under investigation and the protocol used to measure it. We recommend computing a regression between transferrin levels and the levels of the analyte of interest and establishing a cut score based on statistical analysis of this associative relationship. This is a competitive immunoassay kit. Transferrin in standards and samples compete with transferrin conjugated to horseradish peroxidase for the antibody binding sites on a microtitre plate. After incubation, unbound components are washed away. Bound Blood Contamination Enzyme Conjugate is measured by the reaction of the horseradish peroxidase enzyme to the substrate tetramethylbenzidine (TMB). This reaction produces a blue color. A yellow color is formed after stopping the reaction with an acidic solution. The optical density is read on a standard plate reader at 450 nm. The amount of Blood Contamination Enzyme Conjugate detected is inversely proportional to the amount of transferrin present in the sample.